Thermoplastic floor tiles, wall light fittings, blinds to windows, night storage heater, television point, telephone point, ample electric points, video door entry. Views over city opening light to the bedroom, built in wardrobe, carpeted, ample electric points, tv point, night storage heater, ceiling light fitting. Close coupled w.c, wash hand basin on pedestal, Dimplex hot air heater, shaver point, bath with shower unit built over, shower curtain, ample storage space. 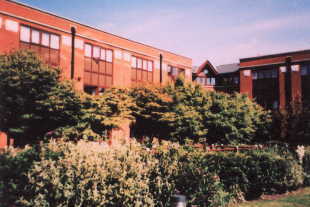 The central courtyard area is well maintained and stocked with mature evergreens, shrub and flower borders and the property benefits from having residents only access to the secure underground parking area, having one allocated car parking space and electronically operated security gates which open onto Cox Street.